Summertime. It’s already hot and muggy in Ohio, consequently I usually don’t want to drink darker beers or heavier IPA’s…I want something to quench my thirst but also have more taste than a commercial pilsner. 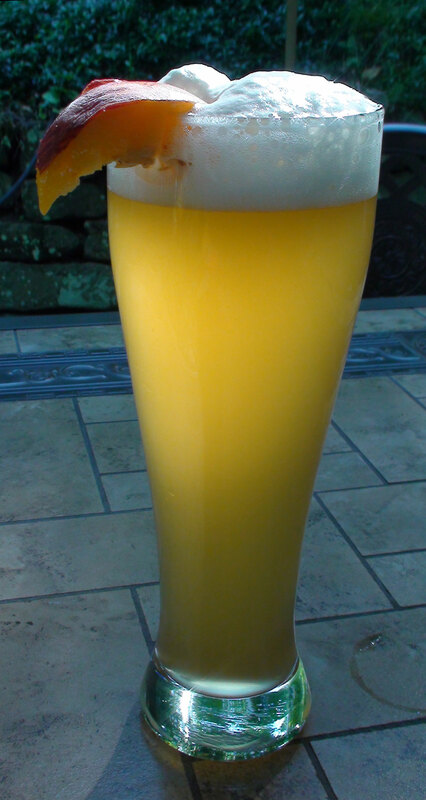 Why a Peach Hefeweizen? I believe that hefes offer a much better beer base for fruits than do typical ales. Ales I find are too malty and sweet and don’t balance the fruit well. Hefeweizens are lighter and more distinctive with their characteristic yeast. I chose peach as not a lot of people do peach but I was later surprised at how awesome the flavor is. Peachy! features about 50% wheat and 50% pilsner malt. You get that perfect light, cloudy beer where the cloves and bananas of typical Hefeweizens are subdued just enough to let the peach really come through.